Bharat Heavy Electricals has successfully commissioned 600 MW thermal unit in Chhattisgarh. The unit was commissioned at Dainik Bhaskar Power's upcoming 2x600 MW thermal power project located at Dhabra in Janjgir Champa District of Chhattisgarh. This is the second unit of the power project, commissioned by Bhel. The first 600 MW unit was successfully commissioned by the Company in 2014. CPI data for March 2014 will be out on 13 March (Monday) and consensus estimates stands at 5.44% Vs 5.37% in Feb 2015. The country's two largest mortgage lenders SBI and HDFC Limited has reduced their home loan rates for retail borrowers. HDFC has brought down its lending rate by 20 basis points with effect from April 13 and following the reduction the company will extend loans at 9.9%.HDFCs cost of funds is likely to decline post reduction in base rate by banks and drop in wholesale borrowings rates and largely neutral for spreads. SBI too reduced home loan rates by upto 25 bps but for new borrowers hence may not have significant impact on NIMs. Tamil Nadu Newsprint and Papers Ltd (TNPL) is planning to set up a 30 mega watt (MW) power plant with an investment of around Rs150crore. It will cater to the upcoming Rs1,500crore multilayer paper board manufacturing plant, which is expected to be ready by the end of 2015. – Positive for TNPL. RPP Infra Projects gained over 8%, touching to Rs162.9, after the company said it has bagged new order worth Rs46.53 crore from Hindustan Prefab an Government of India Enterprise. The order is for construction of 2071 prefabricated toilet blocks for government schools in the state of Andhra Pradesh, RPP Infra Projects said. Apollo Tyres has commenced construction at its upcoming facility in Hungary. The company plans to invest Euro 442 million in Hungary and the production is expected to commence in early 2017. Positive for the company. Maruti Suzuki has targeted a growth of 10-11% in domestic sales for FY16. Along with exports the company targets to sell 1.44million vehicles in FY16 which is in-line with our estimates. The company has lined up a utility vehicles, a compact diesel car, a small commercial vehicle and a premium hatchback for launch during the year. Positive for the company. Industrial production grew at 5% in February, which was higher than market estimates and close to 18 month high.This was mainly on account of improvement in manufacturing activity (up 5.2% Vs 3.3% MoM), a rebound in consumer non-durables (10% Vs -0.1% MoM) and also due to a lower base effect. The pick in IIP suggests, revival in industrial segment which is key to improvement in economic growth. As per media reports, Hero MotoCorp is planning to launch a new metal body scooter in July 2015 which is targeted at the market leader Honda’s Activa. The company has delayed its motorcycle launch so as to focus on the scooter segment. The new scooter will have added features such as telescopic shock absorbers, digital console and integrated braking. View: The added focus of Hero MotoCorp on the scooter segment augurs well for the company. We continue to remain positive on the stock. Finally after some days nifty move to positive value, Nifty move up to 20.85 point at 7880.80 and Sensex move up to 71 point at 26368.38. In morning session nifty opened weak value. Researcher are saying, market not a properly good working on Monday so all traders alert and take a advice for a good trader or advisory service. About 30 shares have advanced, 20 shares have declined and zero shares have unchanged. Top gainers is Jindal Steel, Infosys, Axis Bank, PNB, Tata Steel, Tech Mahindra, Coal India. Top losers is Sun Phrama, NTPC, DLF, Cipla, Dr. Reddy's Labs, BHEL, M&M. We are providing offer to our customer in Diwali Festival from 10 October to 19 October 2014 so hurry up and join with us for a good opportunity. Nifty sensex hover arround on 7850, Nifty move down to 6.45 point at 7853.50 and Sensex move down to 41.80 point at 26255.58. In mornig session nifty weak opened and break 7800 point value. About 19 shares have advanced, 31 shares have declined and zero shares have unchanged. JP Morgan cuts its India GDP growth projection for 2014/15 to 5.1 percent from 5.3 percent after weak factory output print. The Reserve Bank of India projects GDP to grow at around 5.5 percent in the current fiscal year ending March 2015. 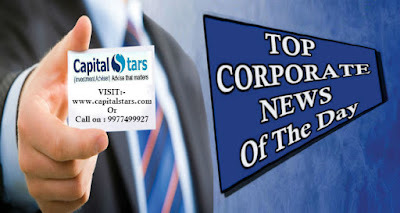 Top gainers is Jindal Steel, Infosys, PNB, Coal India, Tata Steel, TCS, Tech Mahindra. Top losers is DLF, M&M, Bharti Airtel, Dr.Reddy's Labs, Cipla, BHEL, NTPC. We are presenting bumper offer as "buy 1 get 1 free" in diwali festival to investor, those traders investment in equity and commodity market so hurry up and trade with us. 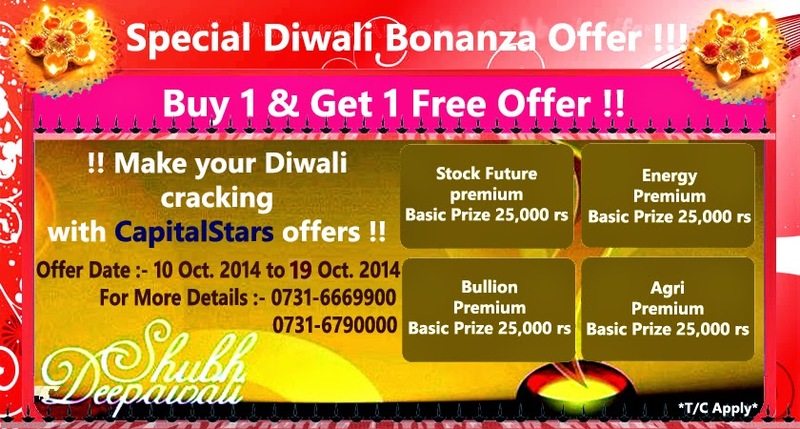 Diwali Dhamaka Offer For U Hurry Up !! !!! Diwali Dhamaka Offer !! !